View from the ramp below La Casetta al Ponte built in the 1700’s in the Medici-style of Tuscan architecture in the Lunigiana. …100 sqm/1075 sqf and sleeps 4 persons… was intended to be the Master’s House at Il Poggiolo but, as it often happens in Italy, death divided the property and so, it was never completed. 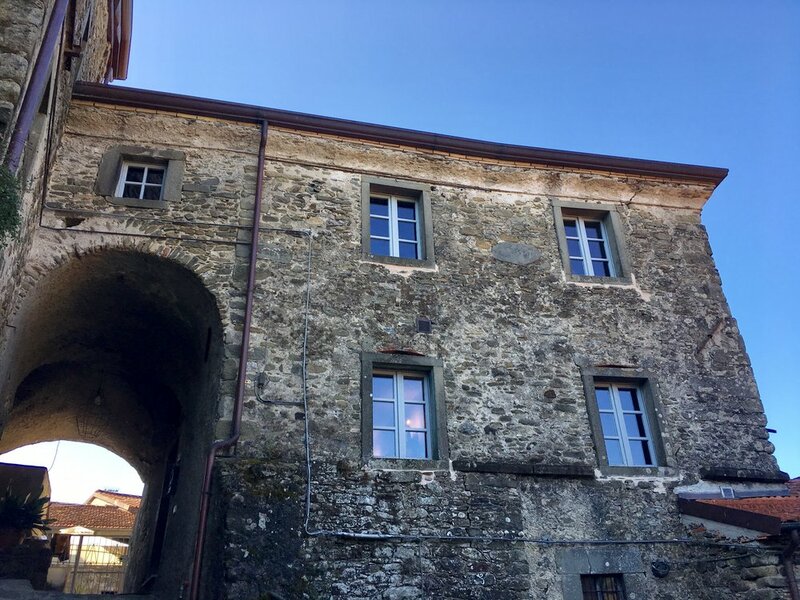 The Entrance to the two-story house is under the tall arch of il Poggiolo’s ramp from Codiponte’s Medieval bridge. 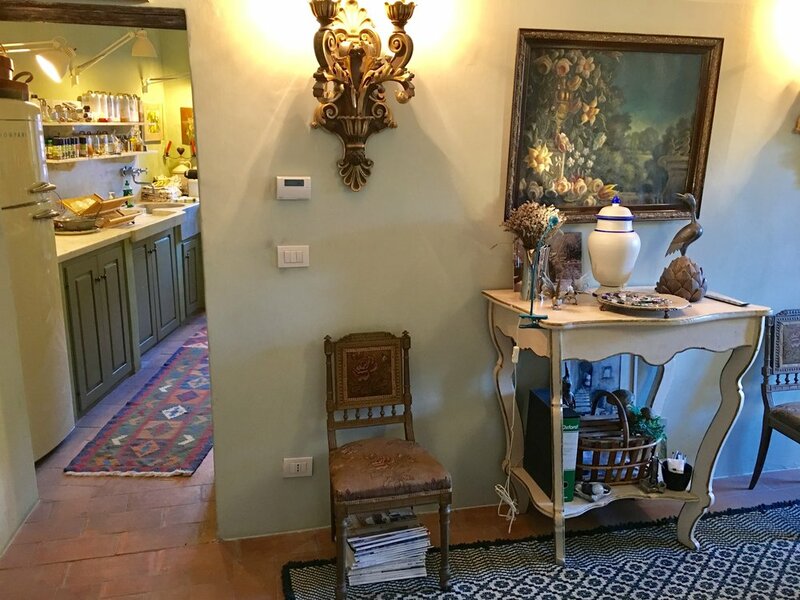 You enter the main room which serves also as a DR. Off it and on the left is the Kitchen complete with a large refrigerator/freezer, oven and 4 burner cook-top, dishwasher and plenty of storage, etc. The door to the right in the main room leads to the Guest BR with two single-beds. The stairs leads up to the large Salotto with an enclosed fireplace. Passing through an archway in the LR, there is a short corridor and La Casetta’s single Bathroom. Beyond is the Master BR with a comfortable double-bed and views out the windows of Codiponte’s famous church and campanile bell-tower. 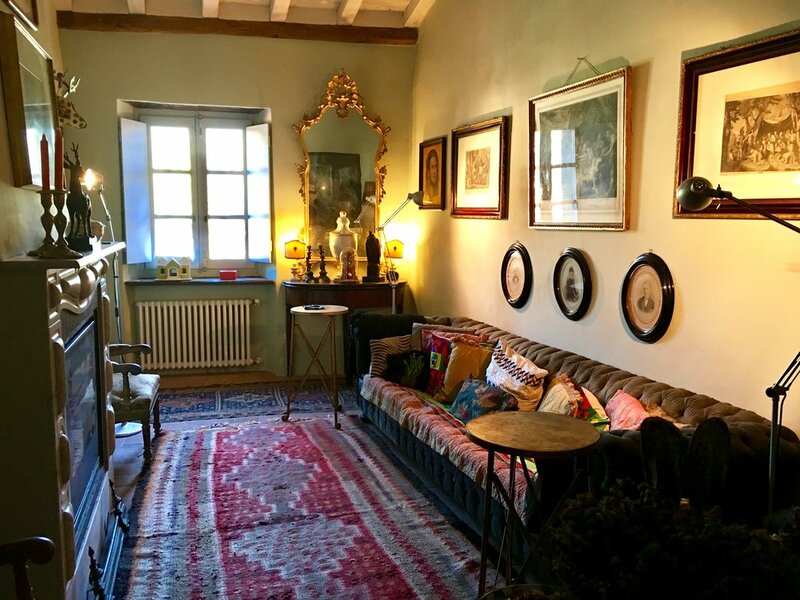 The decor is an eclectic mix of period antiques, flea-market finds and contemporary art and furnishings contrasted with the sage paint-colour of the walls throughout. 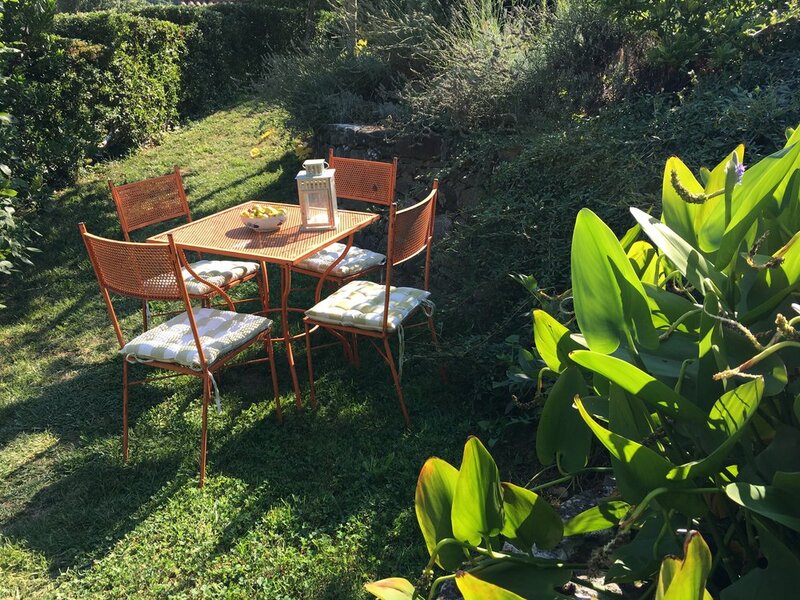 Il Poggiolo’s Garden is for use by our guests and to reach it, go out the front door and past the grey painted gate, take the first left through the cantine and out a double-door to a 2,000 sqm/25,000 sqf garden of grassy terraces planted with flowering bushes, fruit and olive trees. There’s even a Fish Pond! Chaises, chairs, tables and blankets are available. One last word: La Casetta al Ponte has central heating which, makes it an ideal spot to pass a warm Christmas or New Year’s holiday! Information… Minimum Stay: 3 nights Euro 300. 1 Week Euro 600. 2 Weeks Euro 1,000. Extra-night Euro 100. Extra-person beyond 4 persons Euro 25 per night. Final Cleaning/Bed-linens & towels are included in the prices. Bookings during the Winter, Heating Surcharge of Euro 50 per night for central heating and firewood. Wi-fi and Parking are provided and are free. Inquires & Bookings: forrest@youritalianconcierge.com Please specify La Casetta al Ponte and include your dates, full name and address. Thank you. Dining Room on the Entry Floor of La Casetta al Ponte. The Guest Bedroom with two single beds on the Entry Floor. Again upstairs, the Master Bedroom with views to the Pieve church. Outdoor dining next to the Fish Pond. From the Entrance looking towards the Kitchen. The Salotto with an enclosed fireplace upstairs on the 2nd Floor. A portrait of our adored Weimaraner, Moses, in the short hallway.